The Challenger is a British tier 7 turreted tank destroyer. It is often called one of the worst tier 7 tank Destroyers, although in actuality, once you are past the first gun and turret, it becomes a reasonable competitive vehicle as long as you play on a map with ample concealment. Under the right circumstances it can be used as either a sniper, or a flanker, though it is not ideal in either role. The Challenger leads to the Charioteer. WHen it was introduced, this tank suffered from a poor synergy between the vehicle and the gun. The 17 pounder's low alpha damage required that you hit targets repeatedly in order to do significant damage, but the vehicle lacks the armour to stand up to return fire and it's large silhouette and poor camouflage values make this tank difficult to conceal (even with camo-oriented setup, most enemies will spot you from about 350m). The resulting combination was reminiscent of an M18 Hellcat that lacks the 90 mm gun. This is playable at Tier 6, but for a Tier 7 vehicle it poses considerable difficulties. Since Patch 9.20.1 the Callenger has been buffed with the 32 pounder gun, which allows it to operate as a sniper, combining reasonable alpha damage with good accuracy. 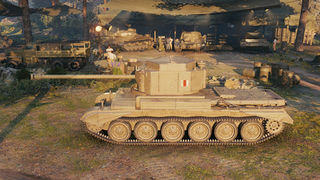 An interesting thing to note is that the stock turret of the Challenger is very similar to the turret on the TOG II*. 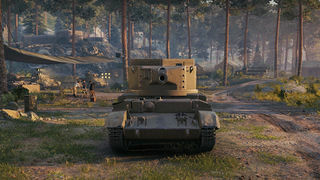 This is not coincidental; during development, the TOG II* was fitted with a variety of turrets, the final configuration seen today in the Bovington Tank Museum and in the game used the Challenger's turret. The first thing that you definitely want to research is the gun, the tank is useless without the second gun and so it is a must. Next, research the second turret, as it will give you a huge RoF boost and is actually lighter than the first. Once you have the second turret, research the top gun. After this, research everything else in any order, it doesn't really matter. 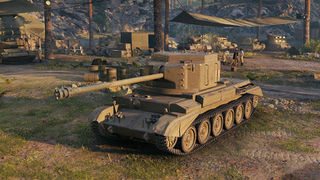 Note that if you've fully researched the Achilles, you'll have all modules available immediately with the exception of the turret and tracks. The 2nd turret is lighter than the stock turret, so the tracks can be researched last, if at all. Since stealth and manoeuvrability are your only defence, you will need to train camouflage on all crew members. Once the first skill is at 100 percent, immediately change the commander to sixth-sense. Skills like situational awareness and recon to increase the view range are also useful. However, keep in mind that this is not a tank you are likely to keep in your garage once you have unlocked the Charioteer, so additional crew-training should focus on the needs of future vehicles. The Tank, Cruiser, Challenger (A30) was a British tank of World War II. It mounted the QF 17-pounder anti-tank gun on a chassis derived from the Cromwell tank to add heavier anti-tank firepower to the cruiser tank units. The design compromises made in fitting the large gun onto the Cromwell chassis resulted in a tank with a powerful weapon, but with less armour. The extemporised Sherman Firefly conversion of the US-supplied Sherman was easier to produce and, combined with delays in production, meant that only 200 Challengers were built. However, it was able to keep up with the fast Cromwell tank and was used alongside them. The driving force in the development of Challenger was Roy Robotham. Robotham had been a Rolls-Royce executive in the car division who, with no work to do, had led a team to develop a tank powerplant from the Rolls-Royce Merlin aircraft engine. The Rolls-Royce Meteor gave the British a powerful, reliable engine, which would power the A27M Cruiser Mk VIII Cromwell tank. Robotham's contributions gained him a place in the Ministry of Supply and on the Tank Board, despite his lack of experience in tank design. The General Staff brought forward specification A29 for a 45-ton 17-pounder-armed cruiser tank based on needs identified in the African desert campaign. The design weight of this vehicle was too heavy however, and prior to manufacture the specification was passed over in favour of the alternate specification, A30 at 10 tons lighter. In 1942, an order for an A30 based tank was placed with Birmingham Railway Carriage and Wagon Company (BRC&W) expecting it to be based on the Cromwell components also being manufactured by BRC&W. Turret and gun mounting was in the hands of Stothert & Pitt. Birmingham Carriage had to modify the Cromwell hull to take a bigger turret. 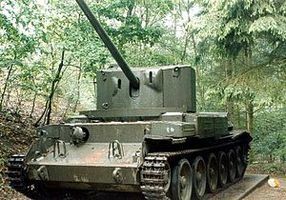 The design received additional emphasis when it was found in May 1943 that the Cromwell was not going to be able to fit its intended armament. Vickers had been developing a 50-calibre-long 75mm "High Velocity" tank gun. It was realised late in the design process that the Cromwell's turret ring was too small to mount this 75 mm (3.0 in) gun. 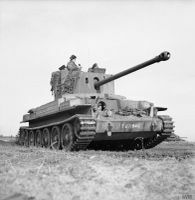 Thus the Challenger would be the only British cruiser tank to mount a weapon that could tackle heavier German armour until the arrival of the A34 Comet. British tank production was a limited resource however, and insufficient numbers could be made. In the lead-up to D-Day, Sherman tanks were upgraded with the 17-pounder creating the interim Sherman Firefly. 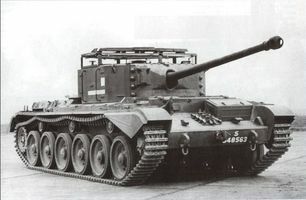 Conversions of Sherman tanks to Fireflys was simpler than production of Challenger, and the A30 order was cancelled after about 200 had been built allowing BRC&W to focus on production of the Cromwell. The tank was rendered obsolete when the Vickers HV 75 mm gun was developed to become the 77mm HV (actually 76.2 mm calibre) to arm the Comet tank. The 77mm HV used the same projectiles as the 17-pounder although with a reduced propellent charge compared to the 17-pdr. The 17-pdr was briefly used on earlier marks of Cromwell's successor -the Centurion tank. The Challenger in this game is an amalgamation of the Challenger cruiser tank and the Avenger tank destroyer. The Avenger utilised a new hull based on the Comet cruiser tank; the turret was never fitted to a Challenger. The 32-pdr gun configuration is fictitious. It was only used on the Tortoise heavy assault tank. Allied star identification marking is missing. The Royal Armoured Corps recognition mark (or flash) was only used until mid-1942; the Challenger entered service in 1944. This page was last modified on 17 April 2019, at 18:15. This page has been accessed 67,323 times.